July 21, 2015 By Tina M 23 Comments This post may contain affiliate links. Read my disclosure policy here. If you’ve been following along on my DIY Facial tutorial…..we are now to the DIY face mask portion! And this is a favorite, because both RAW HONEY and ORGANIC COCONUT OIL are SUPER AWESOME for your skin! Honey has antiseptic and antimicrobial properties that are great for healing the skin and keeping bacteria and fungus at bay. Honey is also great for brightening your facial complexion. We don’t need to get into coconut oil, because I have lots in the past on previous post, and you can find tons of info on the internet on the benefits of using it on your skin. They are endless. It is like a miracle product. Just make sure the honey is raw (not generally found at your typical grocery store), and the coconut oil is organic, virgin coconut oil. Quick Tip: If you have some handy, include a few drops of fresh lemon juice into your mixture to help tighten and shrink pores! use 1 Tablespoon coconut oil, and 1 Tablespoon honey. Directions: Mix your raw honey and coconut oil together until you have a sticky (well-mixed) texture. It may seem thick at first, but the honey and coconut oil will actually warm up and soften on your face, so be prepared for a few drips! 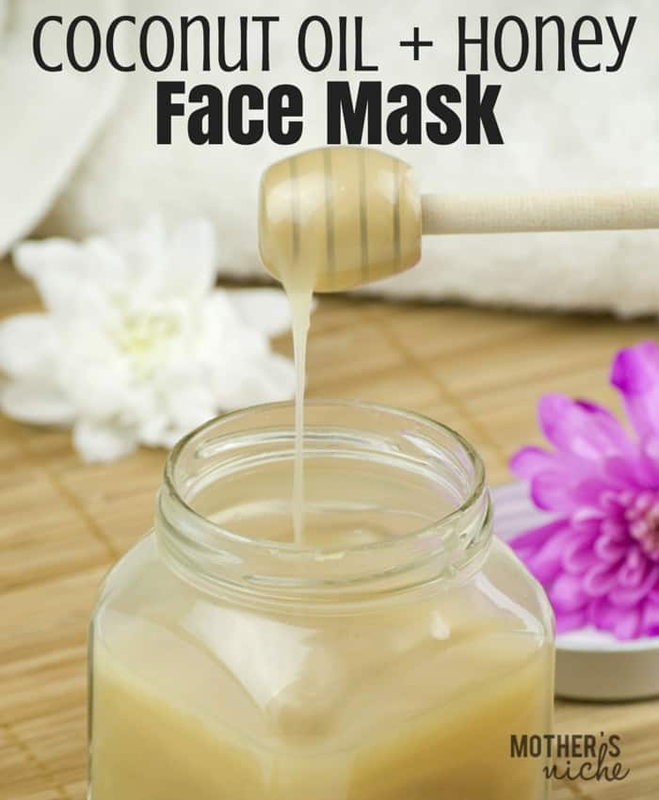 Keep the DIY mask on for about 15-20 minutes and rinse with warm water. *Coconut oil can be more thick or thin depending on the temperature of your house, so fit he mixture doesn’t seem thick enough, you can slightly adjust the measurements. I’m an almost 40 year old medium brown skinned african american female in Chicago. I have a few small darker acne spots on my face that I would like to fade. I’m gonna try this twice a week for the next month and then post again to let you know my results. I’ll use Manuka honey and squeeze fresh lemons. Thanks for the recipe! How did this work for you, Stephanie? What mask would you recommend for dark skinned person with large pores and acne? Helloo!!! I love this DIY, how many times in the week i need to apply the DIY on my face? I’ve been using honey on my face since I was 14 yrs old , and now at 44 yrs old I’ve never had black heads, or pimples, or any other skin issues . I use it for an hour 3 to 4 times a week. In cold weather I’ll mix in a little coconut oil for moisture and for a facial scrub I’ll mix in a little baking soda. Hi can I add an essential that may help with uneven/ discolored skin and old acne mark scar on my cheeks. I literally have become a hermit in my own home. So embarrassed when I go out and people stare at my face. Please help. Hi, I know that turmeric tends to help a lot with healing acne scars and hyperpigmentation, you could look into some turmeric face masks? Maybe try turmeric wih honey and yogurt? Good luck! I love this diy! It makes my skin feel amazing! Would Recommend! What do you moisturize with? Coconut oil or do you have a tecipe? I have this mask on right now! I love Coconut Oil for my skin, my hair, and my food! I’ve been trying different DIY face masks lately and found this one. I never even though of coconut oil for my face. Awesome idea. Thanks! Does this mask applicable for sensitive skin too? And yeh is it okay if it’s used every day? How often will I have to do this?? My cheeks are red and extremely dry. It has a really rough texture. I love coconut oil too & want to experiment the facials. If I steam shall I exfoliate & then apply the facial after? How many times shall I exfoliate & use the facial a week? Also can coconut oil be used as just as general moisturizer before bed or after steaming? Due to some scarey damage on my chest up by my neck was painful to even touch so started using Nivea lotion Essentially enriched with almond oil formula to slather all over my arms and chest after showering. Was surprised to see after few weeks my skin has improved, doesn’t hurt to touch on my chest anymore amd my arms don’t look as bad. Was thinking if that lotion helped what could Coconut oil do for my skin? Will be getting some coconut oil to use for cleansing and moisturizing my skin all over. About 4-5 years ago also had spot on left breast with squamous cancer taken out. Boy did that wake me up to what had been doing to myself. Seeing all those awful looking marks on my arms and legs scared me also besides how awful they look..
Have read about benefits of coconut oil before, time to use it, hopefully not too late to so some repairing. 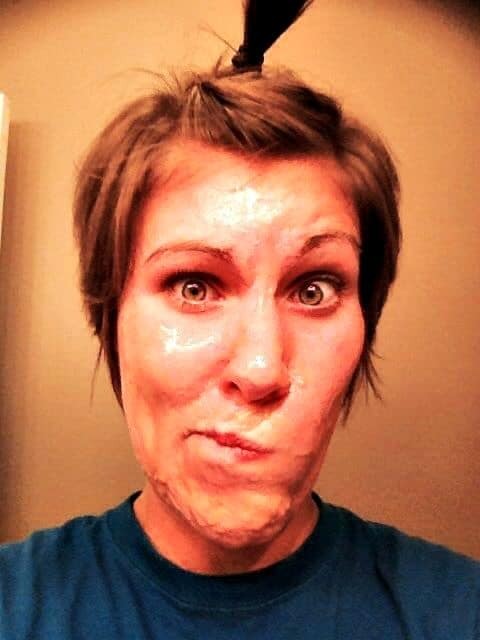 Hope if other younger women read this will heed warning of what tanning can do to your skin. So glad I clicked on this post. Can you mix this and save it to use for future dates or is it a mask that you need to use right away?? I own a children’s party business and would like to us it for our Spa parties. Is this shelf stable if I make a larger batch? Really enjoy the article, I usually add coconut oil to my cream and the result is great.